I got this cute idea off of Pinterest and just had to try it. Basically you take an old lotion or shampoo bottle and upcycle it into a little holder for your cell phone or iPod, so that your counters aren’t cluttered with technology. You cut the lotion bottle, so that the back is taller than the front and then cut out a hole for the plug to go through. You then give the surface a rough sand (so the Mod Podge will stick) and then cover the surface in podge. You cut a piece of fabric and apply it snuggly over the podge. Trim off the extra fabric and then apply another layer of Mod Podge. The complete tutorial can be found here. Basically, this was a pretty easy project, but in the end a bit of a “fail”. I did not actually try to fit my cell phone inside the container prior to doing all the work. Duh! The bottle I used was not large enough and so I ended up with a “mini” version of the original. I hate it when that happens. Although my phone does fit in (snuggly), it is a bit awkward because of the lack of clearance between the plug and the top of the phone. I would totally do this project again, but be sure to pick a bottle that is large enough and test it before going to too much trouble. We use our holder all the time, but for used batteries that need to be taken to recycling. I have a recycling container at work that I take them to when our little caddy is full. (Unfortunately, we would need to have a caddy on every plug-in the house to accommodate all the phones and iPods ~ one just wouldn’t cut it any more). 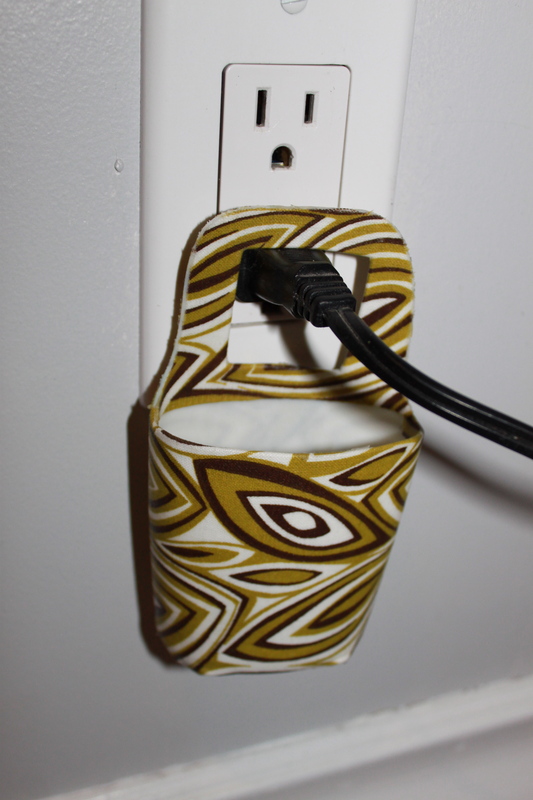 Posted on August 5, 2013 by Cindy Roy •	This entry was posted in DIY and Upcycling and tagged cell phone holder, DIY, pinterest hack. Bookmark the permalink. ← Those Bi-Fold Doors Have Got to Go!